Jill has worked in innovation and technology development for 20 years within the high-tech start-up business sector and more recently within the Further Education sector. As manager of InnoTech, Jill is responsible for the stimulation of innovation, creativity, entrepreneurship and business development across the College. In particular, she is responsible for the design and management of a range of technology and innovation support services to SMEs including needs identification with reference to new product, process and service development, R&D support for new product development and intellectual property protection. Recently InnoTech was recognised as the leading college for employer engagement in the UK and has become established as an important support centre to some 1500 businesses who engage with staff to provide support in areas including engineering, design, software and renewable energy. She is also responsible for the leadership and management of EU funded R&D projects in South West College of total value in excess of €14 million. Jill is a qualified electronic engineer by profession and has held previous positions within Amphion (SME electronic design house, Belfast and San Jose) and DSiP Laboratories. She holds a PhD in Digital Signal Processing from The Queen’s University of Belfast and has published a number of research papers and journal articles in the area of image and video processing. Jill has also served as a principal UK expert within the UK Imaging Processing Standards committee and is a former member of the Joint Photographics Experts Group (JPEG). 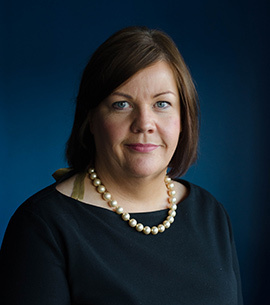 Jill has a particular interest in STEM education and leads Northern Ireland’s first STEM Centre, a state-of-the-art teaching facility focused exclusively on delivering educational and instructional activities in the area of STEM.